Full HD 1080P Sports Action Camera offers a better quality of images and videos and makes your photos sharper, clearer and less distorted. 2.0 Inch high definition screen that displays and replays good videos recorded, ideal for filming every moment of your life. 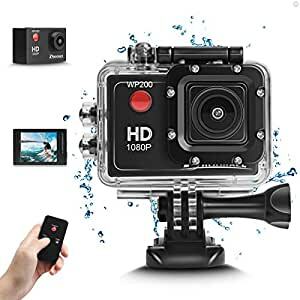 Underwater camera with waterproof case allows you to dive up to 30 meters and keeps the water away from the outdoor camera, all buttons can be operated underwater. You can easily take it snorkeling or even diving up to 98 feet! Ideal for outdoor activities such as swimming, water-skiing, surfing, etc. Video Camera compatible with TF card up to 32GB, perfect for surfing, skiing, detachable battery that is easy to replace and prolongs your classic cameraâs service life. Action Camera with longer battery Life,rechargeable 900mAh high capacity lithium-ion battery records up to 90 minutes of 1080P/25fps video shooting time. There’s no separate battery charger included due to safety reason. Digital camera comes with other fascinating style mounts accessories kit, available for kinds of sports, such as cycling, motorcycling, running, diving, skiing, snorkeling,etc. This fantastic waterproof digital camera camcorder comes with 2” LCD display,support for wireless remote control. This sports camera cam is bundled with IP68 waterproof case,ideal for water sports like diving swimming, drifting, surfing etc.Just enjoy your moment with our video camera.